Is there anything better than eating a burrito while supporting local kids at Virginia Mason Memorial’s Neonatal Intensive Care and Pediatrics Units and Children’s Village? 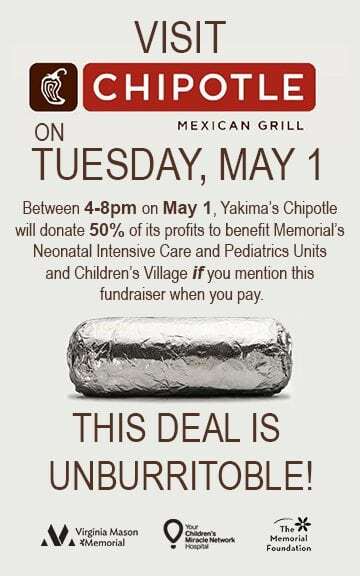 Kick off Miracle May today by eating at Yakima’s Chipotle Mexican Grill between 4-8pm and 50% of the profits from your order will be donated to Children’s Miracle Network IF you mention the fundraiser at the register. Don’t forget to mention the fundraiser for the donation to count. This deal is unburritoble!